Apart from the high-level discussions, side events at Rio+20 showcase interesting innovations – one of them, that caught my eye, is a football that turns kinetic energy into electricity: SOCCKET. A 30min football game could power more than 3 hours of light, and a two-hour game will charge a mobile phone, Jessica Matthews, CEO of Uncharted Play, which produces the SOCCKET football, told SciDev.Net. The ball is built of durable materials with a patented technology packaged at the center of a little black box inside the ball. The ball also lasts for at least three years – much more than an average football, said Matthews. She was promoting the ball to business people gathered at the Corporate Sustainability Forum, hoping to strike new partnerships to custom-make and distribute the ball to children in poor areas of developing countries. So far, the football has been distributed to children in Brazil, Costa Rica, El Salvador, Honduras, Mexico, Nigeria and South Africa, but Uncharted Play is looking to expand and reach more of the 1.6 billion people who are currently without electricity. But at a price of around US$40 it may prove a tough sell. This blog post is part of our coverage of Rio+20: United Nations Conference on Sustainable Development. To read news and analysis on Science at Rio+20 please visit our website. As angry protests against multinational oil companies go this one was quite refined. As soon as Martin Haigh, brains behind the Shell World Energy Model, rose to tell the 2,800-strong Planet Under Pressure audience of his company’s vision of the future he was interrupted by three protesters who stepped onto the podium and unfurled a banner reading “No More Greenwash — Shell”. The protesters (whom I understand to have been London Rising Tide) then obediently followed a security guard out of the auditorium, though they shouted a few inaudible protests as they went. After a moment’s reflection, the audience began a little clapping which slowly grew into widespread applause. Not quite a standing ovation for the protesters, but an indication that the general inclination of a hall-full of people whose lives are spent documenting, or fighting, planetary destruction is against Shell. Perhaps not a good launchpad, however, for the efforts of scientists to engage with industry, unless you feel that frankness should be the basis of any fertile relationship. Very true, none of us wants our energy supplies pulled out at the plug. But others might argue that it’s decades since the alarm was raised. The ASADI conference rounded up today with a brief roundtable session to discuss lessons learned and the way forward. Final panel discussion. Rob Adams is third from the right. Boaventura Cuamba of the Academy of Science of Mozambique said the conference had revealed to him the difficulty for individual academics to find resources to do research on expanding electricity access but noted that if African researchers collaborated regionally, they would have access to more resources. Cuamba’s feelings were echoed by Gibson Mandishora, a member of the Zimbabwe Academy of Sciences. 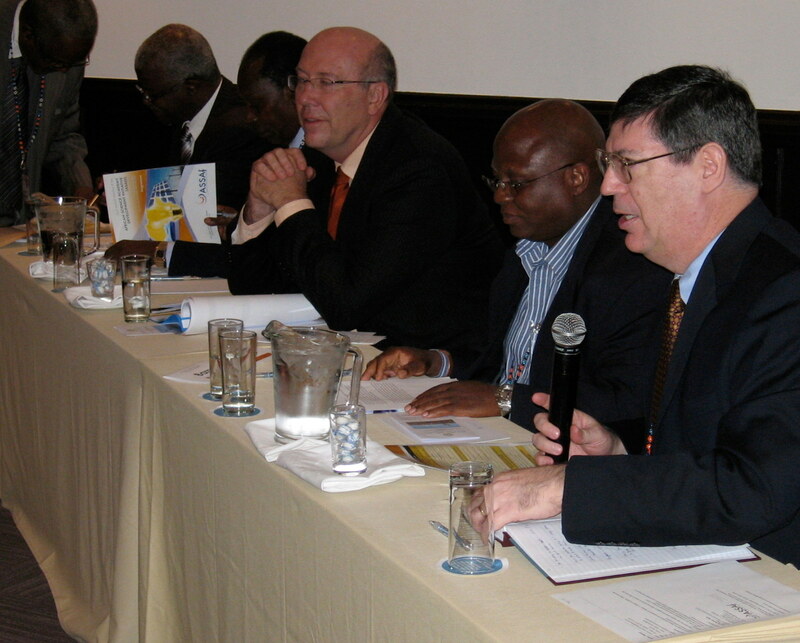 He said that academies must foster close intra-Africa collaborations on energy issues. Everyone agreed that academies could and should have a key role providing governments with scientific advice. But Rob Adam, chief executive of the South Africa Nuclear Energy Corporation, advised the academies present to work on their credibility. “You must gain good credibility to be able to give advice. The face that you have as an academic does not mean a minister or a policymaker will be prepared to listen to you,” he said. But academies would gain credibility only by proving their ability to provide quality advice, resulting in a “chicken or egg” situation for aspirational academies, Adams added. Last night at the dinner hosted for researchers at the Wallenberg Centre, at Stellenbosch University, South Africa’s deputy minister of science and technology Derek Hanekom said a target set by his government to give electricity to every household by 2015 was unrealistic. Since the country’s first democratic elections in 1994 the number of South Africans with access to electricity has increased from 30 per cent to 75 per cent (although reports of the latter figure at the this conference have ranged from 70 per cent to 85 per cent). But it is the last 25 per cent that will be the hardest to reach, Hanekom said. These are often people in remote villages where connection to the national grid would be very expensive, and thus take longer than most expect. The situation is even more difficult in the rest of Africa. Just after breakfast this morning, I chanced to meet David Mbah, executive secretary for the Cameroon Academy of Sciences, who told me that rural electrification is a huge challenge in his country. Mbah said that in his home village of Ashong the government had erected pylons for about 10 kilometres, but there were no electricity cables. Funding, he said, had run out in the government’s electrification plan. “They came up with the budget, and programmes of action, but for now the programme is stagnant as the government is looking for partners to fund the implementation,” he said. Embracing new energy technology without training skilled people to maintain the new gadgets is not the way to go for Africa, South Africa’s science and technology minister, Naledi Pandor, said on Monday night. “No one has made a provision to repair solar panels when they break down. Skills associated with the positive technology must be made available so that we can confront future problems,” she said. This morning, Barry Bredenkamp, from the South African National Energy Efficiency Agency, made a similar point. 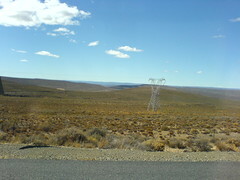 South Africa recently set up a Working for Energy programme. This programme aims to marry the rolling out of sustainable energy options in South Africa with job creation, focusing on up-skilling the unskilled. The programme will intentionally choose labour-intensive alternatives to stimulate job creation. Something for other African countries to consider? South African energy minister Dipuo Peters’ speech from yesterday morning has been published online here. An excerpt is below. “As renewable technologies become more and more affordable, it will be essential for these technologies to be locally produced so that jobs and skills can be created to improve the quality of life of our countries. We cannot continue to be perpetual consumers of imported goods and services without having a stake in the products that we consume. “I am told that you will be visiting some of our energy establishments later today. While most of you will be tempted to applaud South Africa for the superb and modern assets we have, please take time to note that these technologies are on average 20 years old.